Down & Dirty: Molly tagged me. Molly tagged me today. She's done this once before and I ignored it (which I felt kind of bad about). So this time, because I love Molly, I'm playing the game. I'm surprised by how uncomfortable it makes me. I've always considered myself an up front, spill your heart to anyone, give it all away kind of gal...yet I hesitate. Do people really want to know these things? 1. What's the story behind the name of your blog? I'm lumping these two together because I can't answer one without answering the other. My blog is named after Down & Dirty, my third book; I'm very proud of it. It's full of projects for beginning (and not-so-beginning) gardeners. I've included some family gardening projects, a few tasty recipes, and a lot of my heart. The book came out in February, 2007 and the PR people at my Storey Publishing thought blogging about the book would generate buzz. I was surprised by how quickly a business effort became entirely personal. I was unsure how to start; I'd never been much of a journal-keeper. But writing in short, independent bits feels natural to me and I loved blogging almost immediately. 3. What has been your best blogging experience? What about the worst? No worst experience so far (knock on wood), although when I was cut off from the internet in Hijiori-onsen I felt a few pangs of blog withdrawal. The best thing about blogging has been the way it connects me to friends, family, and people I don't even know. 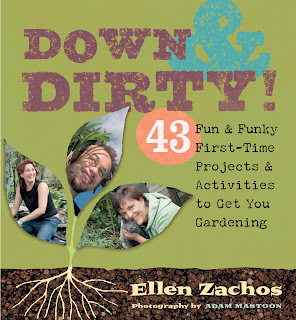 I can vouch for the fact that 'Down and Dirty' is a terrific book, and more than a gardening book! Congratulations, "it" girl, on your wonderful book (which covers everything, really everything - how did you do that??) AND on almost a whole year of blogging. I would love your blog even if I did not already love you ;) But I do. YEA! see, now wasn't that fun?